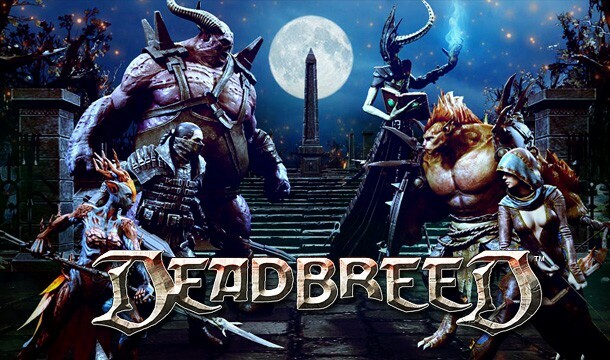 In Deadbreed, the brand new MOBA game from Deadbreed AB, the heroes, or champions, are called breeds. At the games launch there are 9 breeds to choose from. Here’s a short breakdown of each breed to help you along your journey when first entering the game. [/heroes]Corpus is merely the bones of a cadaver raised from the dead to die again; death no longer has dominion over this nameless soul. Corpus is a Half Breed Fighter whose abilities include Dash, where you can dash towards a target and gain an armor shield, Ooze, where you emit a puddle of ooze in an area that reduces enemies move speed, BoneToss, where you throw a bone that cuts through the air in a line, and stunning the first enemy it hits, and Soul Steal, where you devour a part of an enemy unit’s soul, dealing Power Damage and gaining Health Regen. [/heroes]Brimstone, a Counsel Witch Hunter was charged with disloyalty and confined to the covenant awaiting trial. He is a Halfbreed and a Fighter whose abilities include Thrust, where he dashes forward, passing through and dealing Power Damage to all enemy units in your way, Vigor, where your battle prowess increases and you gain Attack Speed for each spirit you hold, Critical Chance bonus for every Nectar you hold, and Attack Damage bonus for every Blood you hold. Brimstone also has a shield in Deflection, where you create a divine light around a target allied hero or yourself, rendering the hero immune to all damage, and Sacred Light, where you emit a sacred light stomp that cuts through the air in a Cone dealing damage and stunning all Night Breed enemies. [/heroes]Cinder the purist was sentenced to serve in the Deadbreed covenant as punishment for saving her husband from becoming a human sacrifice to their celestial being. Cinder is a Half Breed Assassin whose abilities include Backstab, where she appears behind the target and has a damage amplification for a few second, Toxinate, where her Critical Chance increases for every blood she holds and Attack Damage bonuses for every Nectar she holds, Spiritwalk makes her move to a Spirit orb within a certain range, and Spirit Emit allows her to emit a Spirit at a target point within a certain range. [/heroes]Lilith the Blood Countess was sentenced Deadbreed after hundreds of ancestral testimonies to victims tortured and killed by her. She is a Half Breed Mage whose abilities include Hemoglobic Nox, where she adds a drop of Blood to the resources she holds, Umbrage is where she projects a blood trail that deals Power Damage to all enemies in a line, when the trail fades, she dashes to its end. Blood Soil is when Lilith infects a target area, reducing the Power Resist of enemy units and inflicting Power Damage for every second they stay in the area, while Blood Flux is a channeled skill that unleashes a blood cascade that deals Power Damage to ALL enemy heroes in a certain range, and stuns them periodically. [/heroes]Domini was cast ouf from the blood horde and sentenced to serve in the covenant after leading an up-rise against the Carrion Tyrant. Domini is a Day Breed Fighter whose abilities include Huntsman where he consumes Blood which causes him to grow larger and increases his Health, Attack Damage and Move Speed. Bloodscent is where Domini and allied Heroes, within a certain range, gain Life Steal when attacking enemies, Lupine helps create a pool of blood beneath a dead corpse that lasts for a certain time, when in range of the pool, it will regenerate Health for Domini. And finally Apocalypse is when he summons an Apocalyptic Void that reduces all Enemy unit’s Attack Speed if they are in a certain range. [/heroes]Ivy the faun of sovereign, was doomed to the covenant of the Deadbreed after unauthorized drinking from the fountain of life. Ivy is a Day Breed Mage whose abilities include Deadly Blossom where she plants Nectar to create a flower, which will destruct if an enemy gets near it, causing damage. Quake, causes the earth to shake, dealing Power Damage to units in the area, and making them move in a random direction for a time. Entangle summons roots from a target area on the ground that deals Power Damage and stuns enemies within a certain range, while Photosynthesis allows Ivy to regenerate health for each second that it is cast. [/heroes]Demonata is the only Komodo Shaman of the Deadbreed, a predator of the night. She deliberately traded her immortality for eternal death to join the covenant. Demonata is a Night Breed Assassin whose abilities include Death Pulse, where Demonata affects the pulse of all units in an area that deals damage to enemies and heals allies, Blood Chill, where your shriek chills the blood of enemies in range, causing them to turn and flee for a certain amount of time. Shadow Bend is an invisibility skill that is channeled and Transfusion is where Demonata exchanges health with an Enemy or Allied Hero within a range. [/heroes]Nekros was an advocate at the counsel of Deadbreed until he was excommunicated and forced into the covenant of the undying himself. Nekros is a Night Breed Mage whose abilities include Soul Feed, where you consume of of your Spirit points to regenerate health to an allied unit in range, Shatter Spirit, where Nekros channels to shatter a spirit you hold which deals Power Damage to enemies on front of you. Bind turns all Spirit orbs in an area into ghosts that will follow and fight for you, while Reanimate will allow you to target a hero corpse and turn it into a skeleton that will fight for you until it is killed. The skeleton cannot use any abilities. [/heroes]Due to the foul circumstances of his first death, Brood is eternally bound to re-possess his original decaying carcass when summoned under the covenant of the Deadbreed. Brood is a Night Breed Tank whose abilities include Death Breath, where he exhales a putrefied cloud that deals Power Damage based on the amount of Spirits you hold. Putrified Skin gives Brood a shielding layer that absorbs damage, Lord of the Flies unleashes a cloud of flies to surround a unit for a set amount of time, and incrases their Armor and Power Resist, while dealing Power Damage to ALL nearby units. Finally, Stomp, discharges a mighty stomp that cuts through the ground in a line, dealing Power Damage and stunning enemies for a short time.